White paper on crime 2004 Part2/Chapter5/Section4/2. Halfway houses provide various aid such as accommodation,meals,employment support and counseling and advice for(1)probationers,parolees or those who receive urgent aftercare of discharged offenders whose care has been entrusted by probation offices(entrusted aid)or(2)those who apply for aid personally when the entrusted aid has terminated due to expiration of the prescribed period of urgent aftercare or other reasons(voluntary aid). Halfway houses are established separately for men and women and for adults and juveniles,or accommodate them separately within the same house.As of April1,2004,there are a total of101halfway houses with a total accommodation capacity of2,253persons(Source:Data by Rehabilitation Bureau,Ministry of Justice). Fig. 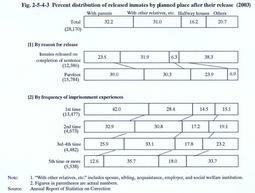 2-5-4-3 shows the percent distribution of inmates released from penal institutions in2003,by planned place after their release.The percentage of those parolees who were to abide in halfway houses was higher than that of inmates released on completion of their sentences.The percentage of those aiming for halfway houses increases in proportion to the frequency of imprisonment experiences.